Christmas in London is really wonderful. Stunning christmas lights on many of the busiest streets, festive events, christmas markets with treats, gifts and delicious seasonal food - and of course lots of places to hang out with friends and family to soak up the atmosphere. This site covers all the best things to do during Christmas in London 2019. We have organised the site into (hopefully) helpful sections, with the most popular pages including christmas markets, christmas hotels and things to do with kids at xmas. If you are looking for something a little different to do over the festive season, take a look at the cryptically titled unusual. It's all about what to do at Christmas in London (mainly November and December). Trafalgar Square is generally considered not just to be the heart of London, but the focus of the whole of London at Christmas - every year a tree is gifted by Norway to the UK. 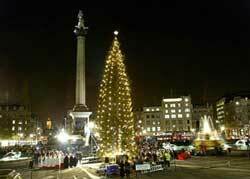 Trafalgar Square has also become a huge focus for New Year's Eve where thousands of people celebrate at midnight. Last year was crazy, and we imagine 2019 will be exactly the same. In recent years the area has become more pedestrianised so it's much better to walk around, and if you do find yourself there during the day, we recommend visiting the wonderful National Portrait Gallery on the North side. London and Christmas go hand in hand. The beauty of the Christmas lights, great shopping for those amazing gifts and the fun of walking around the the world's greatest city soaking up the festive atmosphere. England is a perfect place to spend a christmas holiday - you get all the tradition and the appropriate weather. Just 243 days to Christmas! When I think about Christmas Day, the first thing that pops into my head is 'family'. I think it's an international tradition, where Christmas is celebrated, that families come together on Christmas Day.